Mar7 by John M. Buol Jr. The Army’s previous training doctrine attempted a simplified approach to zeroing that tried to be successful without having to explain concepts that are important to marksmanship, gunnery, and a basic understanding of ballistics. As explained in FC 23-11 Unit Rifle Marksmanship Training Guide doctrine developed through World War 2 and used through the Viet Nam era started with a 1,000-inch range. Up through the end of the 1970s, the Army used bullseye-type targets intended to maximize consistent sight picture. The last of those was the so-called Canadian bull. This target was in use when the M14 and M16 were both in service. Set at 25 meters (1,000 inches) the grid has squares at two minutes in size. The aim point is fairly obvious at 6 o’clock and centered at the white square, making for a consistent mark, especially with iron sights. Doctrine then was to establish a 250 meter zero, which requires two different points of impact for the M14 compared to the M16. Note the two Xs. The top X above the mark is the intended impact for the M14 and the bottom X below is for the M16. The target doesn’t explain any of this. While it’s a great mark and grid for knowledgeable shooters, this does not describe most Soldiers and the Army found most personnel didn’t understand how to use this. There are two ways to fix such a deficiency: The first is to teach everyone in the Army units of angular measurement and basic ballistics to insure understanding among personnel down to the unit level. The second approach is to develop a method that eliminates the need to know or understand any of this. The Army chose the second option. A silhouette was chosen over a more refined aiming mark because it mimics the targets used in qualification and the field, not because it’s ideal for zeroing. The M16A1 rear sight had two apertures: The normal height one intended for a 250 meter zero and a second, taller aperture marked with an “L” setting for longer range shots past 300 meters. With an M16A1, a 250 meter zero intersects initially at 42 meters. The taller “L” aperture is about three minutes higher and an initial intersection of 25 meters yields a 375 meter zero. This allowed personnel to shoot point of aim for point of impact at 25 meters on a scaled silhouette that appears like a full-size silhouette at 250 meters. Using the “L” aperture at 25 meters and then flipping back yields a 250 meter zero. While the M16A1 sights were in one-minute increments, no attempt was made to teach that. In fact, the zero target has drawings and arrows directing what and how to spin the sights as needed. No understanding of the why or how was deemed necessary. This worked fine, until the M16A2 was released. While useful for marksmanship, the A2 sight design is lost on novice shooters. Worse, it ruins that one square=one click simplicity with the A1. Rather than explain these facts, the target was redesigned to take this into account and the provision to go up one click on the rear sight for 25-meter zeroing was made. While not a perfect solution, it was deemed close enough given the novice skill levels of most Soldiers to manage to pass routine, basic qualification. Simplicity was retained for a while, until the M16A4 and M4 was adopted. The removable rear sight is in half minute increments instead of full minute clicks. Unless mounted on an M4, with its shorter sight radius which moves the point of impact further with each click. Again, no attempt was made to explain any of this to rank-and-file Soldiers. This complicated things a bit but a dual-sided zero target with different size grid squares tried to retain the original simplicity without the need to educate Soldiers about why. This was fine… up until technology ruined everything. As the Army trudged into the 21st Century, a host of new aiming devices, lasers, optics, and mounting systems became available. Equipment intended to help Soldiers become more effective destroyed the no-explanation approach used for zeroing as each unique combination of weapon, device, and mounting demanded a unique offset. In response, the Army released the Small Arms Integration Book. Consisting of 448 pages of instructions and charts, the SAIB provided zeroing and offset data for all the then-current options. The problem was the Army had spent the past two decades trying to eliminate the need to understand units of angular measurement and basic ballistics to the point – for simplicity’s sake – that it was found necessary to publish the Small Arms Integration Book. When your organization is forced to publish a 448-page book of instructions and charts in order to retain “simplicity” then it is long past time to consider you’ve lost the plot. Rather than hide from it, the current approach to zeroing is to start by explaining how and why it works. With better understanding comes better capability and the knowledge to adapt when things change. Think of this as a validation of your GT score. Zeroing a weapon is not a training exercise, nor is it a combat skills event. Zeroing is a maintenance procedure that is accomplished to place the weapon in operation, based on the Soldier’s skill, capabilities, tactical scenario, aiming device, and ammunition. Its purpose is to achieve the desired relationship between the line of sight and the trajectory of the round at a known distance. The zeroing process ensures the Soldier, weapon, aiming device, and ammunition are performing as expected at a specific range to target with the least amount of induced errors. For Soldiers to achieve a high level of accuracy and precision, it is critical they zero their aiming device to their weapon correctly. The Soldier must first achieve a consistent grouping of a series of shots, at least three but ideally five. This is a Shot Process and Functional Elements exercise. When the groups look good, the shooter aligns the mean point of impact of that grouping to the appropriate point of aim. Depending on the equipment and distance used, the point of impact may be in a different place than the point of aim. Consult the appropriate Technical Manual to learn what this is. For adjustment, we must understand angular deviation. Imagine the shooter is inside the middle a very large circle with the target on the circle’s edge. Any movement or adjustment is an angle from circle center to circle edge where the target is. The range to the target is the circle’s radius. Every movement or sight adjustment is a set angle and the size of the circle determines how much that adjustment moves at the target. With the target half as far away, the same size angle or sight adjustment moves half as far. Anyone that ever used a compass during Land Navigation understands degrees and that there are 360 degrees in a circle. There are always 360 degrees in a circle, no matter how big the circle. Degrees are far too large for marksmanship and gunnery. A target at 100 yards puts us inside a circle with a 100 yard radius. One degree of angle moves more than five feet at that distance. Just as we can measure length in inches, meters, or miles, we can also measure angles in different increments. Dividing one degree of angle into 60 equal parts gives us sixty minutes of angle, just like having 60 minutes in one hour. This makes for an angular measure that moves about one inch with a target at 100 yards or so and close enough when measuring in meters. The same idea works with mils, short for milliradian. A circle has two pi radians, or just over 6.283 radians. With metric measurement, the mil- pre-fix indicates thousandths. That measures about 6,283.18 mils in a circle. For simplicity, the military often rounds this to 6,400 mils – a so-called artillery mil. The new zero target demands understanding of these concepts. In the center is a 4 MOA diamond and dashed circle, surrounded by a 6 MOA (4cm) dashed circle, same size as old zero target. This is surrounded by 8, 12, MOA rings inside a 16 MOA bull (4-inch black circle, which scales the same as B-6 NRA bull at 50 yards.) Around this are 20, 24, 28, 32 MOA circles (5, 6, 7, 8 inches, respectively.) The entire target has 1 MOA grid squares. Soldiers are expected to learn MOA/mils and use as appropriate. Notice the grid is in an even adjustment of one minute when placed 25 meters downrange, not for any particular sight’s adjustment. No cartoons or pictures show which way to turn the sight for a desired adjustment. The Army’s current doctrine for zeroing procedure demands Soldier understanding of their issue equipment. The Technical Manuals list appropriate offsets as needed. Of course, because the laws of physics haven’t changed, the data in the Small Arms Integration Book is still a valid resource. That will take research on your part. For lasers, it’s likely ideal to establish a fixed offset instead of a crossing point of aim/point of impact zero. The offset method zeroes the windage setting of the laser to remain constantly parallel to the line of bore at all ranges. The most important step in the zeroing process is confirmation at full distance. If we’re supposed to establish a 300 meter zero then confirmation is needed at 300 meters. The 25-meter exercise is a “nearo” that does not guarantee a center hit at distance. The only way to rely on a 300-m hit is to confirm a 300-m zero. Confirmation can be done on any range where shooters can see the impacts of their rounds. Groups should be fired and aiming devices should be adjusted. At a minimum, the confirmation should be done at 300 meters or similarly-appropriate zero distance. If rounds are available, groups can be fired at various ranges to show the firers where their impact will be. When confirming zero at ranges past 100 meters, the effects of the wind needs to be considered and acted upon, if necessary. If a zero is confirmed at 300 meters on a windy day, and then the weapon is fired at a later date in different wind conditions or no wind at all, the impact will change. The Army’s previous training doctrine distilled basic shooting procedures into four fundamentals. The idea was to eliminate details and only use those components deemed absolutely necessary. These four fundamentals were: Steady Position, Aiming, Breath Control, and Trigger Control. The primary failure of this approach has been that it dumbed down the shot process by ignoring concepts that are very useful and critical for anyone wanting to shoot better than merely passing routine qualification. It also gave equal weight to a comparatively unimportant concept like breath control to the point that it has wrongly been considered to be as important as factors that really are very important, such as trigger control. Regardless of the weapon system, the goal of shooting remains constant: well-aimed shots. To achieve this end state there are two truths. Soldier’s must properly point the weapon (sight alignment and sight picture) and then fire the weapon without disturbing the aim (trigger control.) Even though the Shot Process and Functional Elements might seem to additive, this approach is really about gaining enough control for this to occur. The Shot Process is the basic outline of the engagement sequence needed to land a hit. Learning how to pay attention to detail requires learning which details are worth paying attention to. The Shot Process formulates an approach to learning and using those elements that are actually important and necessary. Every well-delivered shot uses this. The sequence does not change, although the application of each element varies based on the conditions of the engagement. Grouping, for example, is simply moving through the shot process several times in succession. Rapid fire speeds this up. Multiple targets in quick succession adds the need to transition between them. Regardless, the process remains the same. The Shot Process allows focus on one cognitive task at a time. As a shooter becomes more skillful, they need to mentally organize the shot process tasks and actions identified as important. For a novice and new recruit, a simplified approach such as the old Four Fundamentals is adequate. When a Solider decides to become a skilled marksman, additional elements and points of emphasis are added to their Shot Process as needed to obtain improved results. In competitive shooting circles, it is common for the developing marksman to write out a personal Shot Process that expands to several pages of description. Such detail creates a disciplined mental checklist which becomes a subconsciously-controlled task through practice. The focus for a skilled shooter becomes a simple anchor allowing them to focus their attention on their external environment while executing their Shot Process as a subconsciously-programmed response. The Shot Process has three distinct phases: Pre-shot, Shot, and Post-shot. Pre-shot items include position, natural point of aim, initial sight alignment/picture, and hold stability. Shot items include refinement of the aim and trigger control causing discharge. Post-shot includes follow-through, recoil management, shot call, and evaluation. Functional elements of the shot process are the linkage between the Soldier, weapon system, environment, and the target that directly impact the consistency of each fired shot. Used appropriately, the Functional Elements build a greater understanding of delivering accurate fire in any engagement. The Functional Elements are Stability, Aim, Control, and Movement. Stability is stabilizing the weapon well enough to provide a consistent base to fire from and maintain through the shot process until the recoil pulse has ceased. This includes the hold, position or posture during the engagement and structures or objects used to provide stability. Aim is the continuous process of orienting the weapon correctly, aligning the sights and on target, and the appropriate lead and elevation (hold) during a target engagement to obtain the lay of the bore needed for a hit. Control are all actions taken before, during, and after the shot process that the shooter is specifically in control of. Of primary concern is trigger control and body control so as to avoid a flinch, pre-ignition push, or other unintended reaction/anticipation during the shot phase of the Shot Process. Control also includes whether, when, and how to engage. It incorporates the Soldier as a function of safety. Movement is the process of moving during the engagement. It includes moving into and out of positions, adjusting as needed (natural point of aim), and moving laterally, forward, diagonally, and in a retrograde manner while maintaining stabilization, aim, and control of the weapon. Functional Elements include important concepts during all phases of the Shot Process and the emphasis will vary based on the shooting. For example, being particular about position stabilization, natural point of aim, a highly refined aim, and smooth, controlled trigger press is important for a Designated Marksman shooting at 500 meters. This changes for a Soldier conducting a room entry and engaging quickly at a target inside the room while moving. The Shot Process concepts remain the same but the emphasis on various Functional Elements varies based on the shooter and environment. Feb21 by John M. Buol Jr. The Army Publishing Directorate has released a number of new manuals that completely revise and update small arms training for all Soldiers. For Soldiers to be expert and professional and able to maintain arms requires knowing how best to use them. For leadership to remain technically and tactically proficient, seeking continually to improve knowledge and practice of their profession requires learning current doctrine as it evolves. Back in the early 1980s, Army publication Field Circular 23-11, Unit Rifle Marksmanship Training Guide was designed to provide useful marksmanship guidance to combat, combat support, and combat service support units. It covered a wide range of topics from the basics, such as zeroing and shot-group analysis, to advanced information, such as night firing, automatic firing, and using the then-new Multi-integrated Laser Engagement System (MILES). The information was specific to guide trainers in providing a sound unit marksmanship program without bogging them down in needless detail. Its intent was to provide deeper understanding behind the how and why of the then-current small arms Field Manuals, such as FM 23-9. The most current Training Circulars are very new and are complete rewrites that establish new procedures and doctrine. Many units have not yet implemented this and many leaders remain unaware of these changes. Like the FC 23-11 did in the eighties, this article provides an up-to-date overview of implementing current Army small arms training doctrine into a sound unit marksmanship program without bogging down into needless detail. Training Circular 3-22.9, Rifle and Carbine was officially released May 2016 with Change One in January 2017, superseding FM 3-22.9 dated August 2008. Since then, all of the Army’s small arms manuals have been completely rewritten from scratch throughout Fiscal Year 2017. If you haven’t downloaded the most current versions since before then, you’re completely behind on current training procedures. Note these are listed as Training Circulars, not Field Manuals. Previously-released small arms doctrine were released as Field Manuals. The current manuals have been released as Training Circulars. Doctrine changes don’t replace fundamental principles for the same reason that doctrine changes don’t supplant known laws of physics. What does change is how the official approach organizes and describes those principles. These new manuals are well over a thousand pages of new training and technical information. Unless they’re gun nerds like us, most Soldiers won’t read all this. My purpose here is to distill the new information in these Training Circulars into something more manageable. Feb13 by John M. Buol Jr. The U.S. Army enacted a Distinguished Marksman program in 1884. In the entire 133-year history of the program, with tens of millions of Soldiers eligible to try, as of 2017 a total of 5,102 Army personnel have earned either Distinguished Rifleman or Distinguished Pistol Shot. Captain Horace Wayman Bivins was the first person to earn both in 1894; a Corporal at the time. Cpt. Bivins was also the first marksman to win three Army marksmanship gold medals in one year. Cpt. 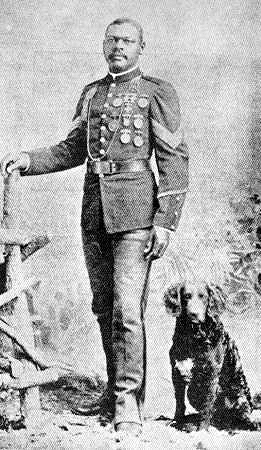 Horace Wayman Bivins, the first Double Distinguished marksman in United States history in 1894, was an African American. It would take more than five decades after this before Jack Roosevelt “Jackie” Robinson was able to receive the same acceptance in baseball, as detailed in the film 42. Lieutenant Colonel Earl Woods, father of pro golfer Tiger Woods, served two tours in Viet Nam as an officer in the Infantry and Special Forces. While in college, Woods once was not allowed to play golf because of his skin color. In fact, the Professional Golfer’s Association of America (PGA) enforced a “Caucasians only” clause in their official published rules until the 1960s. Army marksmanship programs trace their lineage to when General Philip Sheridan officially created the Distinguished Marksman class, as announced in General Orders Number 24, back in 1884. This was formalized by the War Department (predecessor to the current Department of Defense) in 1887. The original concept has been run continuously ever since. Marksmen participate in Excellence In Competition events and the top ten percent of the eligible, non-distinguished competitors are awarded “Leg” points at the event. Like the leg of stool or chair or the leg of a journey, a number of points have to be accumulated over the shooter’s lifetime for specific awards. The first leg is the EIC Bronze medal. After 20 lifetime points are accumulated, the Silver EIC medal is awarded. Once 30 or more points are earned, the shooter reaches Distinguished status. EIC events are held for rifle and pistol shooting and there are Distinguished Rifleman and Distinguished Pistol Shot badges. These awards are more prominent than normal qualification badges and eligible for wear on dress uniforms. Like combatives, instead of Level 1-4 to recognize accomplishment, Bronze, Silver and Gold badges are awarded. Army marksmanship programs are published in Army Regulation 350-66 and 140-1, with the awards and their wear detailed in 670-1. While first started by the U.S Army, all branches of the Department of Defense maintain this program, as does the Civilian Marksmanship Program (CMP) for civilians. Distinguished marksmen come from all walks of life, even outside the military. The CMP maintains all master records dating back to 1884 in their Competition Tracker.